Last year when we moved to DC and the fearsome winter started in my sweet husband surprised me with these fuzzy slippers. I’m one of those people that thinks that 60 degrees is too chilly and my hands and feet are always cold so the gesture was much appreciated! Over the winter months though I started to notice something not so sweet about my slippers-they started to stink. (How embarrassing!) It makes sense when you think about it-feet aren’t known for being pleasantly aromatic, but I was still super bummed out and started searching online for the best way to fix the issue. 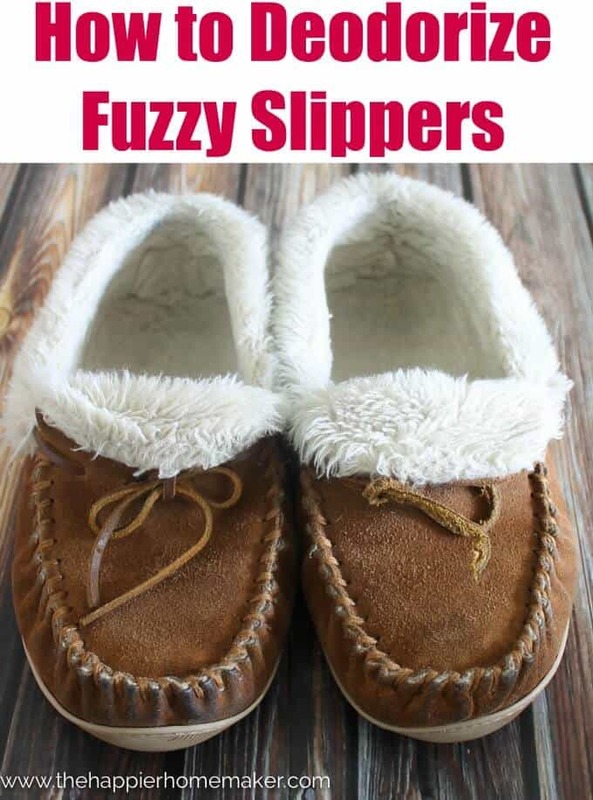 I found a ton of suggestions for How to Deodorize Fuzzy Slippers but some of them were straight crazy-including pouring cat litter in them, freezing them in the freezer, even spraying them with vodka…no thank you, I prefer my vodka in my cocktails! Finally I found what worked for me and wanted to share the quick tip with you today! Pour half the mixture in each slipper and place in a gallon sized plastic bag. Shake to thoroughly coat the slippers-you want to make sure the mixture gets in the depths of that glorious fuzzy lining! Allow to sit overnight and then shake out the remainder into the trash. That’s it! Stink-free slippers while you sleep! No cat litter or cocktail wasting required! Anybody else have stinky slipper syndrome? Thank you so much for sharing! I bought my guy some expensive LL Bean fuzzy slippers and he wanted to throw them away because they stink. I was thinking, “Do you know how much those cost?” Low and behold I came to Pinterest for the answer and found your post. Thank you again!